The brainchild of David de Rothschild, The Plastiki Expedition is a daring plan to sail across the Pacific from San Francisco to Sydney, a distance of over 12,000 nautical miles, in a boat made entirely from old plastic bottles and recycled waste products. The boat will be carrying a team of four scientists from the Scripps Research Institute, who will study ocean acidification, marine debris and coral bleaching during the trip. The scientists plan to take the boat to the open sea in April 2009. Rothschild believes that their endeavor will inspire environmental thinkers to take positive action for our planet. They also believe that this outrageous move will inspire people not to waste and recycle plastic waste in an efficient way. 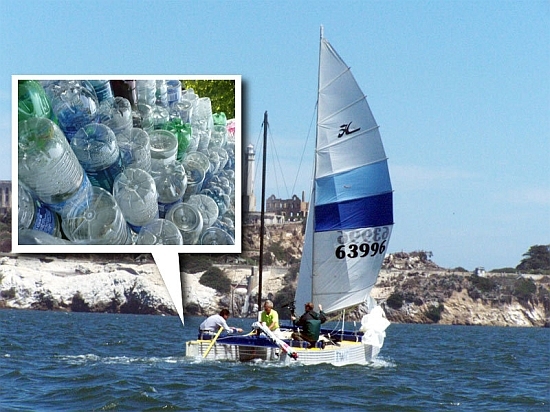 The catamaran they’ve developed is made from 20,000 plastic bottles injected with CO2. The easy construction will enable the team to recycle the boat when their trip is complete.